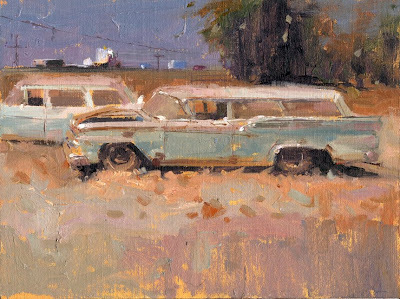 Off the 99 near Bakersfield is a tiny junkyard with mostly bleached out fifties and sixties cars. This is one a a series of paintings on The 99 for my Bakersfield Museum show in December. Map Quest: 1706 Orange Ave., H. B., CA 92647.
apparently simple but very descriptive... I like how you do objects in the same way of the rest of the landscape. That's absolutely beautiful William, everything I love is here, great painting, and superb vintage cars. I didn't see this one at your studio the other day, I like it. The pink and blue is a nice touch. This is a beauty!....look forward to seeing more from this series. I think the lighter palatte combined with the 'blight' theme is really an effective contrast. You seem to have pushed your color up a notch with this beauty. A very fine painting. Reminds a little of a painting by Fairfield Porter of a similar car I once saw. Good color harmony.... and what the others said. I am constantly amazed at your use of color and brush strokes. How DO you do it? Your cars almost seem to float. Cool. I always like hopw you can tell there's natural sunlight in there, like you took a little chunk of the sun--no forget I said that, it sounds too fruity. It's right up your alley, lots of abandoned stuff in the prairie lands rusting cars etc, very cool stuff! Nice, I love it, I've seen that California. Oh look! ANOTHER amazing painting. Fantastic! This is one of your best! I really like your edges and color! I've been so crazy busy lately it's hard to reply to everyone but I always read the comments and appreciate you all posting. Words fail me in so many ways but your painting succeeds in every way... your work is an inspiration.